Warsaw E-commerce expo is the largest e-commerce event in Central Europe. This year’s fifteenth edition brought together over 4 000 participants and over 130 exhibitors. Therefore, Smartsupp, the favorite live chat of Polish online stores, just had to be there! Participation in the event meant a lot of work and preparations from our side. We have presented our new booth (shown in the photo above) and for the very first time, we were distributing the marketing materials in Polish. Being at the Warsaw e-commerce expo gave us the opportunity to meet in person with our partners as Shoper and also form new partnerships with other Polish e-commerce platforms to build out of the box integrations for our customers. To our surprise, we were the only live chat present at the fair. We have showcased Smartsupp to webshop owners and, what was the most valuable for us, we met with many current customers who shared their feedback and insights with us. We even did several interviews with our Polish customers that we will soon share on our blog. We were delighted by the fact that our customers gladly shared their insights about using Smartsupp. One of most important of them is that usingSmartsupp on their webshop increased sales and made customers communicate with the shop more willingly than by phone or email. 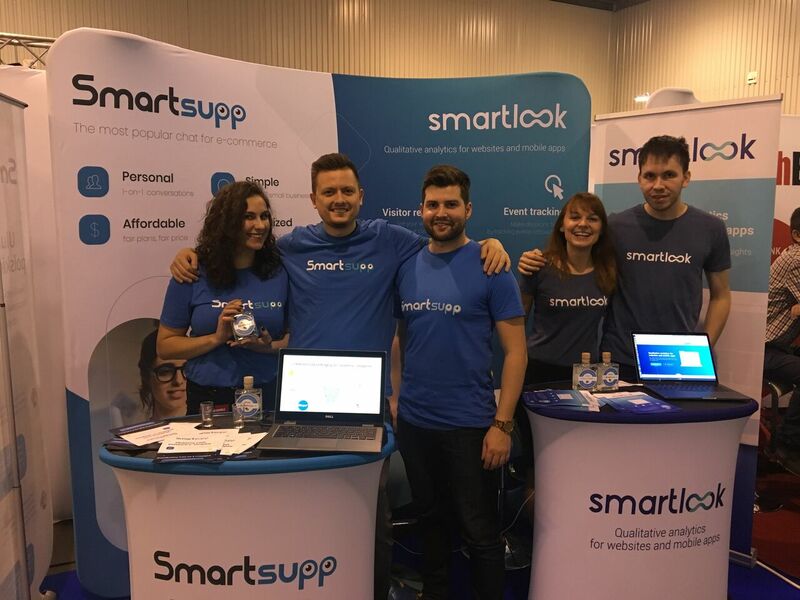 This year’s fair was attended by the Czech-Polish trio, whose members deal with completely different matters in Smartsupp every day, Vladimir – co-founder of Smartsupp, Vojta – UX/UI designer and Zosia – customer hero for Poland and France. Thanks to this, we could comprehensively introduce Smartsupp chat, representing different points of view and fully educate our existing and future customers. The presence of numerous e-commerce platforms at the expo has convinced us that we have taken a good direction by offering as many integrations as possible for popular webshop platforms. We make sure Smartsupp is easy to install for all our customers, regardless of the platform they run on. The fact that we ran out of all leaflets, drank all Smartsupp Slivovitz r(Moravian alcoholic beverage eagerly tried by our customers and partners) and signed up many new customers, proves our participation at the Warsaw e-commerce expo was the right choice. See you during the next edition!